We confess: we here at Bob Thomas Ford Lincoln North are major fans of tech features that make our ride more efficient and enjoyable. 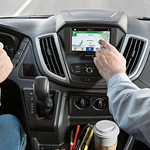 The Ford Transit Passenger Wagon has these types of tech features in spades. Here are two we can't stop talking about. Welcome to the era of apps that integrate smart devices and vehicles. The FordPass App is a perfect example. This app lets you stop/start the wagon, lock/unlock the wagon from anywhere, schedule a start, and check fluid/fuel levels. You can locate viable parking ahead of time, find fueling stations and prices along your route, and pay for services in advance. We never get tired of SiriusXM Satellite Radio. It offers 150 channels to keep the atmosphere light and entertaining while transporting guests and tour groups here and there. SiriusXM Satellite Radio brings you sports, entertainment and news. It's also available online or via mobile device with the SiriusXM app.